We hit the ships twice early this week when the water temps where right, but had no runs. Then new years eve a heavy cold front blasted south and the water temps plummeted to 38 degrees. After the blow, Damien and I went to Rudee to try to find some little reds. The water temp was an very cold 42 degrees, the only fish we caught was the 3" spot that Damien scooped out of the water with his hand. Looking back on 2008 we have had a good year of new discoveries and more fish. The fall red drum run off of sandbridge was something that we always wanted to get on. This year we finally did, and its a whole lot less dangerous that the shoals. When we hooked up we could immediately drop the anchor rope and fight free floating and not worry about the breakers, until it was time to land. The spadefish were another new one for us. We had seen them for years around the 1st island but couldn't ever get them to bite. on one of those super clear water summer days we could see them under us. Mike P rigged up a piece of clam as we told him to not waist valuable slack tide sheepshead time. The moment Mike hooked up we scrambled to rig up and our list of 1st island targets and summer had changed. Even when the clarity muddies back to the usual three foot visibility we blindly dropped back down and found them, all summer. The water temps dropped on the E-shore side early in the week and slowly rose toward the weekend. Shante and I dropped eels on in 43 degree water temps with no runs. So we changed our plans and headed for the ocean with our trolling gear. The current was ripping and we didn�t get far, with no knock downs. 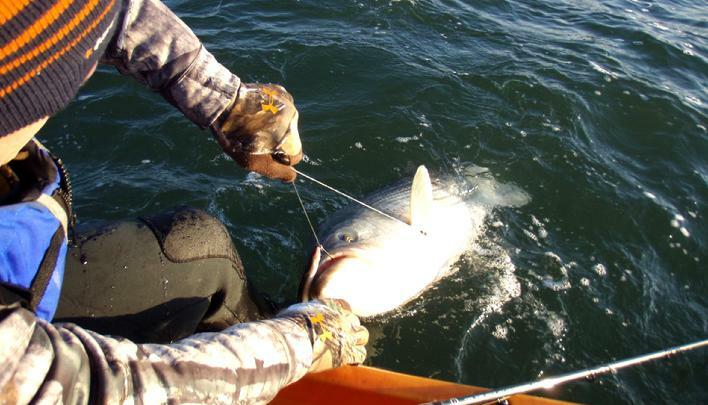 On sat we took our time and launched out to the Cape Henry anchorage area for some hopeful 30� class stripers. The fog was thick so we stayed close to the pound nets. Shante hooks up to a 20�er close to the pilings, so we changed gears again and began casting around the pound net pilings and wore out the small 18 to 20� schoolies. 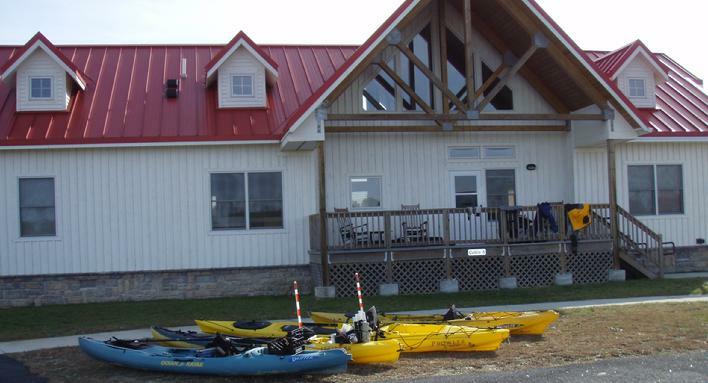 Don from the northern neck kayakers is on a tour of the western side of the bay this week. Check out his progress on his SPOT tracking page NNKtour. The action slowed down as the week progressed. Few were caught mid week and I got out sat and landed a hard fighting 45�er right at the slack current. When I paddled in I know of only a 35�er landed. 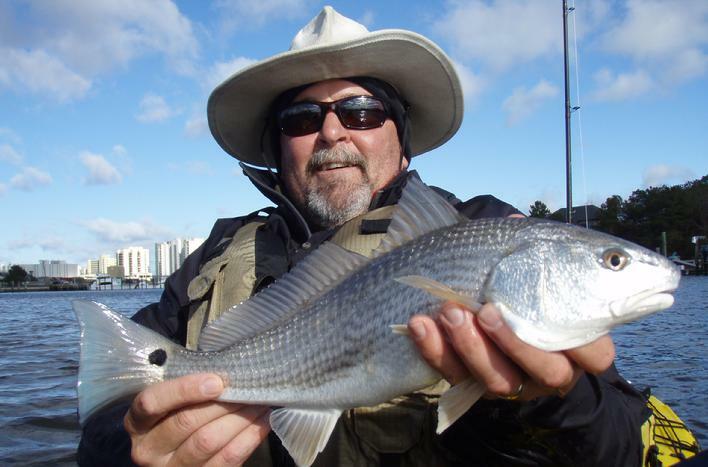 Kayak fishing legend Jim Sammons with his first ever red. 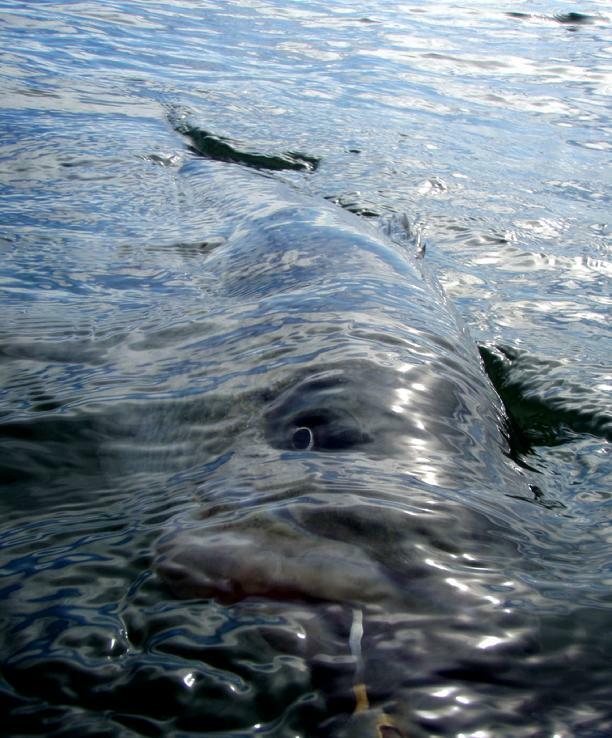 This was the week we filmed for the kayak fishing movie �Game on�. Jim Sammons is the host, website traveling around North America, fishing with local experts for the regions biggest fish. For the east coast it was me and the Kipto stripers. I picked the second week of December for the shoot. 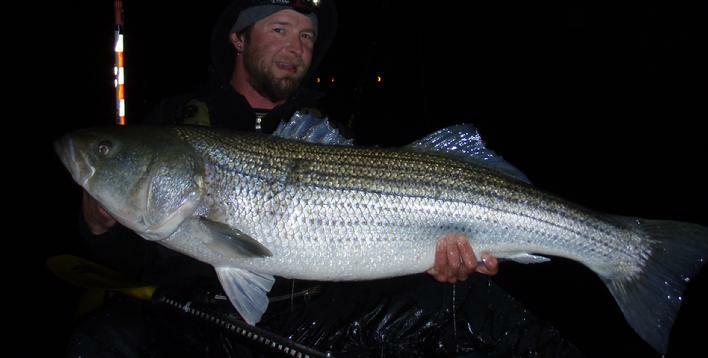 Typically this is a great week, in the middle of the striper run. Sunday night the water temp had dropped to 42 degrees. My confidence level bottomed out. My only hope was the south winds forecasted for mid-week would bring up the temps. Tuesday and Wednesday were foggy and rainy. 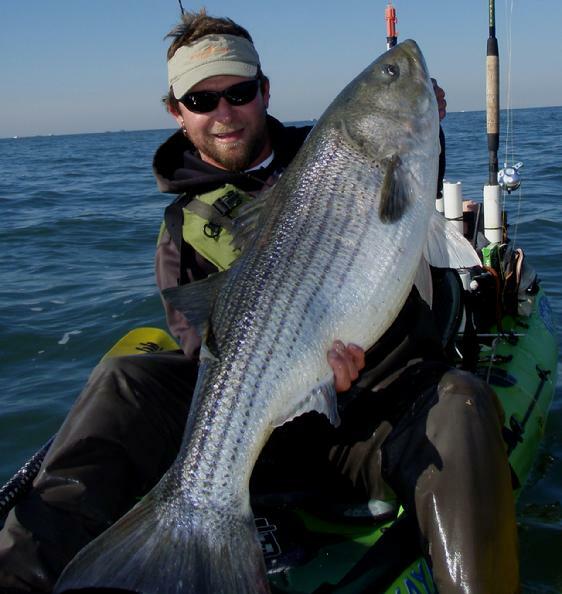 Thursday the winds were hard from the south, so we changed tactics and trolled off of Cape Henry for reported 30� class stripers. It looked fishy with birds and bait everywhere and we chased them past the lighthouse then paddled on the treadmill trying to get back. 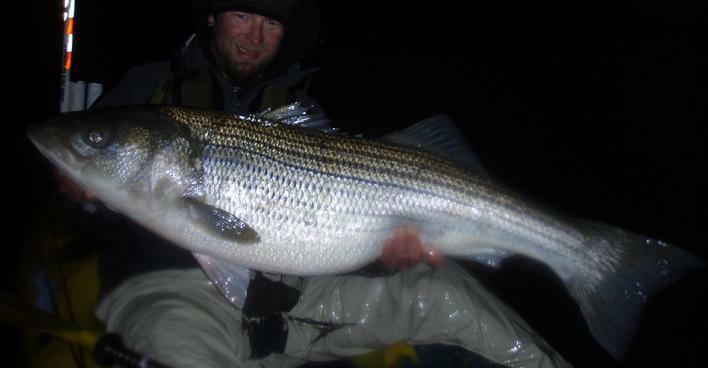 We gave the Kipto stripers one more try that night but the temps had jumped to fast and the fish still had lockjaw. Jim had never caught a striper or a red drum, not even in Florida. We decided to go to Rudee for some reds just to catch something to film. We got�em and I have never been so happy to see some 16 to 18� reds. 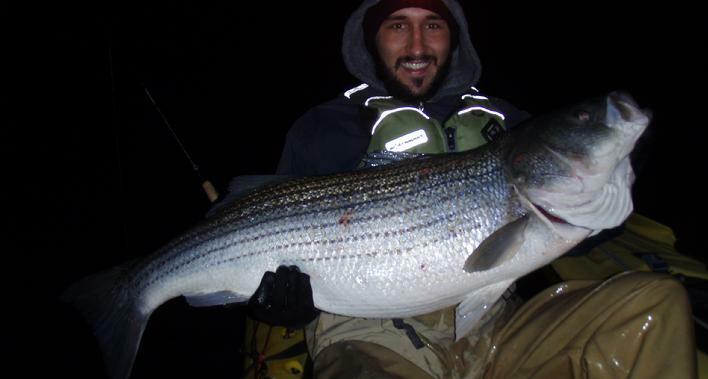 They flew out on Friday afternoon with no striper footage but the Rudee reds saved the week. It was a priceless week for me. I got to hang out and fish with extremely cool and professional guys like Will and Jock and a innovator of modern day kayak fishing and one of my heroes Jim Sammons. I had the lodge for Saturday night, Lee, Damien, Ric and his family. During the day Ric and family went out on his boat. That afternoon I went down to the launch to see if the POL had landed any fish during they�re tourney. They had a 45�er and one break off. The water temps have leveled off at 46 to 47 degrees and I knew it was going to turn on! The current changed and began to run when I hooked up. The fight was nearly done when my reel malfunction and went into free spool. This was my 7th fish lost since the 49lber . I was down but not out, I had another reel at the lodge. I slowly made my way back and got another shot. I fought this one with my thumb holding the line against the fore grip, when the reel would give I could keep pressure on the fish. I broke my losing streak with a 48�er in the boat. Ric and his brother Roger were heading out on his boat as we were landing. They got into them as well. 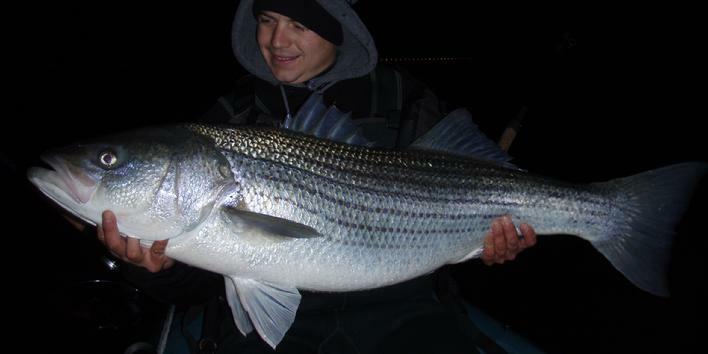 This was the weekend to fish the ships, the action was slow but folks from far and wide were here to land a striper. 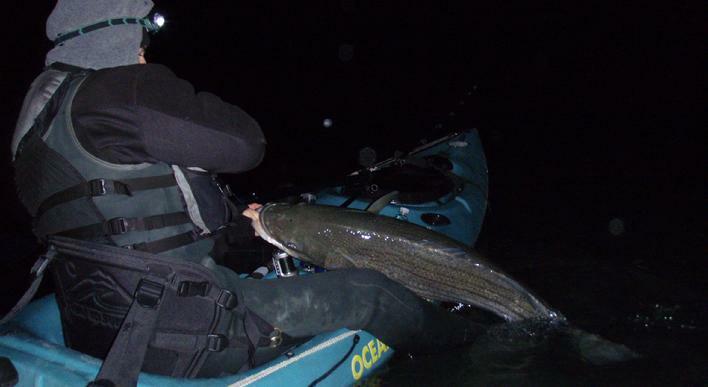 Al and Carl from the east coast kayak fishing team ECKF from New York, Chris and John from Michigan kayak fishing MKF, Dennis from Roanoke, Joel Thompson from Delaware and other out of staters, dropped eels in the hopes to hook up. It was dark and we were all searching for that run. 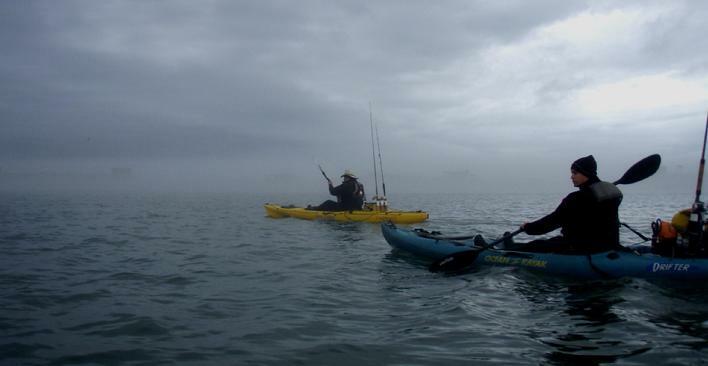 When over the radio Dennis hales me saying � Hey Kevin, I got one!� he sure did, a nice 48�er, his first over 40� kayak fish and his first time at the ships. Four of us were in an ally. I hear a zzzzip! I look over in the direction of the sound, it looked like Joel just turned his reel, then turned his light off. The next sound I hear is a big fish thrashing on top next to the him. He had the entire fight, ten feet from me, in silence. It was well worth the drive from Delaware for the 47�er. On Saturday Lee, Mike P and I paddled out for the drift. We always troll on the way out. Mike P was dredging the bottom when his rod bowed over and stopped his boat. 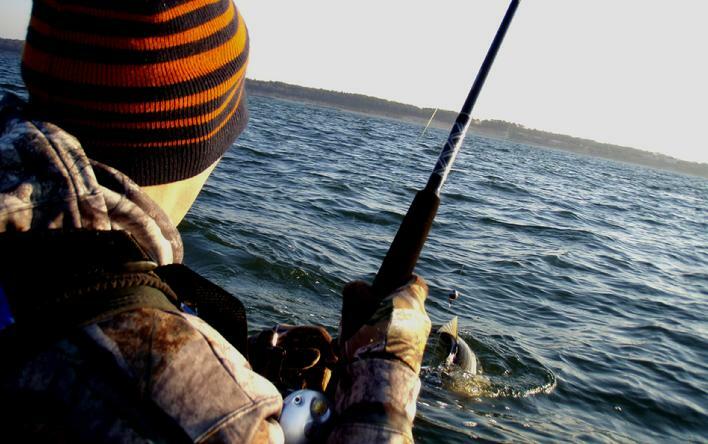 The fight began, pulling him back toward shore for about 100 yards, and ended with a 48�er in the boat. We paddled back in for a break before the night session. The pirates of lynnhaven POL were out with 25 kayaks and a tailgate party in the parking lot. Thanks to �dafishguy� for the hot hamburger, it hit the spot. Back out before dark, I searched for a spot that made my eel nervous. Matt had a good spot that he had been holding for hours. I ended up hanging around with Matt, he hooks into a 47� fighter that pulls and spins him for 50 yards. I was ready to go again when Michigan Chris hooked up to a 37�er. I hung out for another hour and I finally had a run and miss the hook up, my 6th miss in a row. 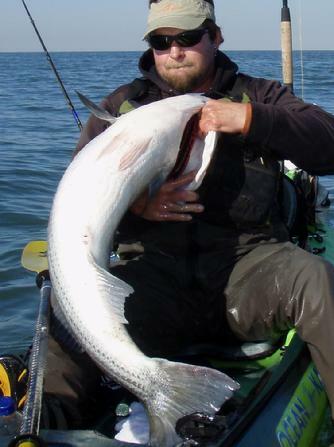 Then new to the ships Romeo hooks up to his first biggen, a 42�er. I was real ready to go to sleep when Matt�s back rod that he had forgot about, bowed over. He had all kinds of chaos going on, he was grappled to a crevice on the wall, I popped it lose with my paddle to set him free while he reeled and secured his other line. Once he grabbed the rod he was spun out away from the wall and landed the 40�er. I had seen enough, after 14 hours on the water and missing my only run I was done. 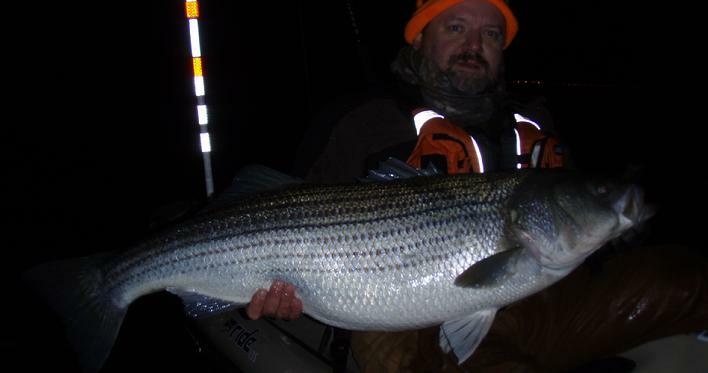 Joel Thompson from Delaware with a 47"er. you think you got a drive to kipto? Chris LeMessurier with a 37" from Michigan. 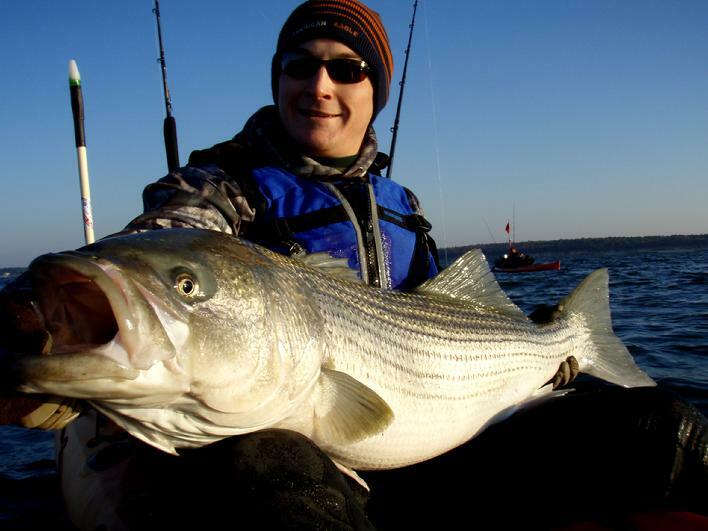 Its been a long, perfect weather weekend with the big stripers. Wayne and I paddled out for the rip drift with the last of the incoming tide toward buoy 18 and Rick C concentrated on the ships. On the current turn-around we were in the area that has been good before. As the current began Rick called on the radio �fish on!!�. Wayne and I were about to pull up and paddle to him which was far. I really dint want to leave, I knew I was in a good spot. I was conflicted, go get pictures or stay where I know something was going to happen. I look over at my down rod in the holder. I had it in gear with the drag back. It was barely bent over, I thought a snagged some grass or a giant jellyfish. I grabbed it and it was moving. I set the hook and the fight was on, spinning me around and pulling me back out. She got into my other line and I cut it. 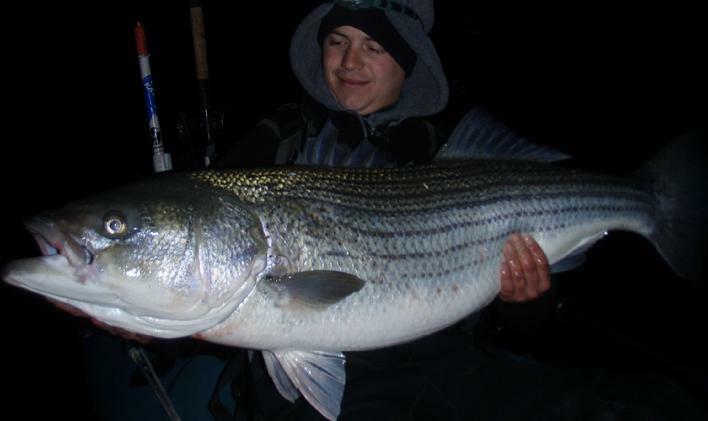 She was 48� and a great season opening striper. Ricks was 45� and on his next drop landed another. The next day I concentrated on Rick C�s hot spot at the same time. Within 20 min I hooked up and landed a 43�er. 20 min later I hooked into a big one. 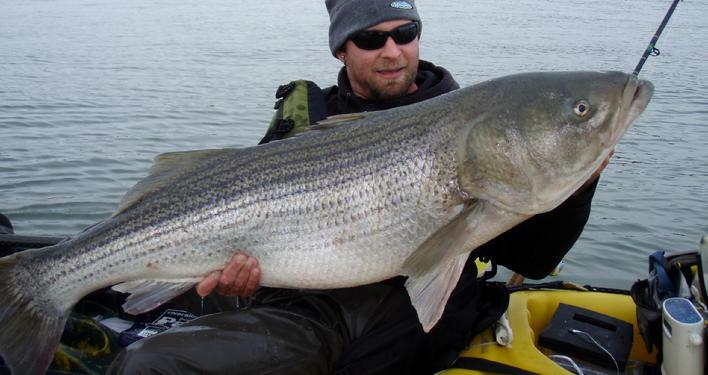 Usually with my over sized �striper stopper� rod I will see a 44� or under fish within a minute. This one was way bigger. She pulled me with the current then turned and pulled me back. At boat side she was a two hander. I measured her at 49� with a 32� girth. I was positive she was a 50lber, so I brought her in after paddling over to John from Middleburg VA and asked for some pictures. On the scale at Chris�s bait and tackle it was 49lb. stretched out she was 51� with a 29� girth. Gotta have the 30� girth to be a �50�. I would not have killed her if thought she was under 50lb. The next afternoon there were a few more kayakers out, and a little before and after sunset everybody landed fish or had runs, and for the first time, I forgot my camera. 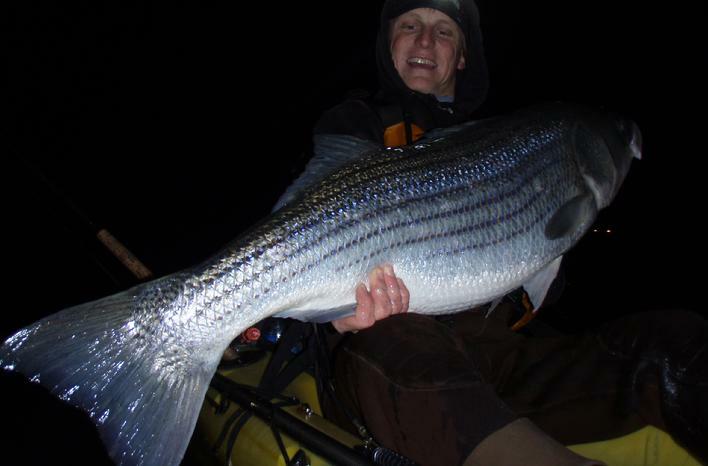 Chris from New Jersey and the East Coast Kayak Fishing crew, landed a 47�er, his first big one. Charlie from Fairfax VA landed his goal with a 44� release citation, and rob from VB landed a 41lber after a hair raising fight with a light rod. Lee showed up and missed one, and Matt horsed in a 45�er. I missed one with a bad hook set, lost one when my reel mysteriously when into free spool during the fight, and pulled the hook out of one that looked about 45�. I was ok with not landing�em, my hands were so shredded from the others, I didn�t want to handle one, just a nice fight and a easy release.